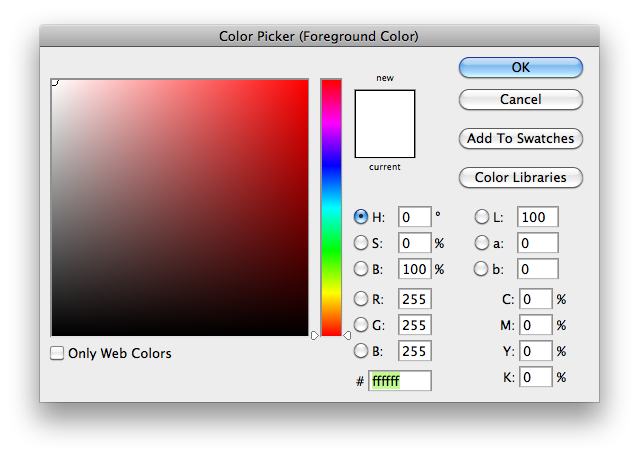 When the color picker is opened, the red field is automatically selected. It's very, very rare that I'd want to copy the red component of a color. However, I copy the HEX value very often. Usually it's to copy a color, then paste it into another picker, like when I'm copying a shape's fill color. It'd be great if the hex field was automatically selected when the picker is opened, saving several clicks (four clicks when copying and pasting a shape's fill color). If we did that we'd probably want to have the HEX value above the H: field so the tabbing order remained somewhat consistent and reads left to right like a book. I'm all for that. I agree that tab order is important. It's probably worth noting that being dropped into the red (R) field is what happens now—a field that's in the middle of the tabbing order, not the start. How's this? HEX is now top left field, plus I've had a crack at some other tweaks. - Colour swatches for current and new are bigger than previously. - Window size is similar to the one in CS5. - OK and Cancel are now bottom right of the dialogue. This is usually a good thing as bottom right is considered the end of the page/window and the place people look for the buttons to save changes. - Older (current) colour is on the left, which is usually seen as being the past by left to right readers. - New colour is on the right, which is usually seen as being the future by left to right readers. - HEX field is top left. - Color Libraries and Add To Swatches have a little more breathing space (text only just fit previously). The extra space may aid with localization, too. - Lots of things line up, where they didn't previously. +1 From me. Great design. I see no need to leave off the Web Safe option. I still use it on occasion, like when I'm using a limited spectrum of greys. This is a perfect layout, honestly its surprising Adobe didn't make a change like this years ago, and I hope they do soon! I agree, it's a nice layout . . . but I feel like putting the color-picker area on the right is too jarring a change. I wonder if Marc put it on the right just to be different, or if there's logic to it. In a world that reads left to right, it seems most practical to put higher priority things leftmost. For any color-picker dialogue, I think the color-picker area is highest priority and should therefore be on the left, the text fields on the right, then the main dialogue buttons (OK, Cancel) underneath them. I agree that the highest priority items should be on the left, and I think that's exactly why Marc put the color picker area on the right. I agree with his choice. Most of the time I open this dialog it's to copy/paste from the hex field or to tweak one or more of the numeric fields. In contrast, I rarely ever use the picker area. And when I do use the picker area, having it on the right plays quite intuitively into my right-handedness since I'm usually in more of a painting mode of work & thought—kind of like dipping into a color well. But really, when I am painting I prefer a more pure color-picking / color well experience anyway, so I almost always use the HUD Color Picker introduced with CS5. - I use the color picker dialog window when I want numerical color control, so having the text fields at the left seems better then. - When I do want an actual color picker experience, I just use the HUD Color Picker anyway—having a color picker area on the dialog window seems more a convenience and legacy-support option to me. I like that a lot. This would be very useful. I've contemplated bringing up that layer fill/colors should be possible to copy/paste, or that you could even have a color for an entire folder of layers that you could change globally. I'm begging you, I would love this. Yes, this small thing would be amazing! At the very least make it default to the last used field. Yes please. Would love it if the hex values were capitalized as well. I frequently need to cut and paste from this dialog into an annotation document, and uppercase hex seems to be the preference of the developers who receive it. I applaud this idea. Yes to auto-selecting the HEX field, or at least providing an option to select it in Preferences. In that vein, what I've long wished for is a "Remember last highlighted field" behavior that I could toggle, because there are times when I've had to make large numbers of iterative changes to one or two specific fields (such as when tweaking a single hue across a saturation range) where having the HEX field auto select would be equally as annoying as it is having the R field do so. It would make much more sense if the Adobe Color Picker automatically selects the HEX color when it is displayed, making for much easier copying and pasting. 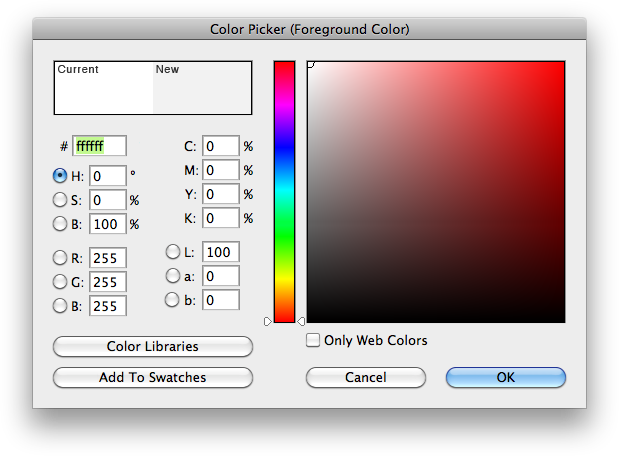 Currently, the R value (RGB) is selected field every time the color picker shows. HEX values are the only fully universal and portable color value between applications, why not add this functionality? Select HEX code text when color picker displays.. Brilliant. Love it (i.e., selecting hex field, and your revised dialog layout). Good job, Marc! Adobe . . . please take note! A small improvement that would speed my workflow up is to have the HEX field selected when the colour picker opens. HEX field to be selected when the colour picker opens. This is in the 13.1/13.0.2 retina updates. Even though It's years after implementation, I'd like to show my gratitude, now that I finally found the founder of the idea to instantly select the HEX value in the color panel. It's a productivity optimizing implementation I'm using every single day. It's the only color value existing out of one field, so it can be simply copy pasted into other field by just opening up the dialogue copying, go to the desired field and paste it again. I know I'm just explaining what it can be used for, but I'm glad I got to see who is responsible for the idea.